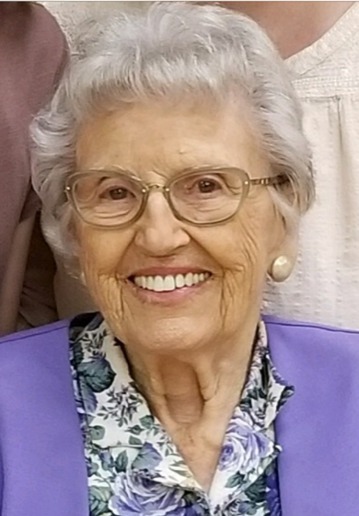 Christeen Nielsen Hall, age 94, passed away peacefully, surrounded by family, on Sunday, June 3, 2018. She was born on August 23, 1923 in St. Johns, Arizona to Frederick and Mary Eliza Holgate Nielsen. She grew up on a ranch near St. Johns, along with her 13 siblings, Nellie Richey (Hugh), Mae Richey/Greenwood (Forrest/Hartley), Louie Merrill (Earl), Lizzy, Frederick (Lavora), Ole (Gwen/Olivia), E.Z. (Lula), Olive Shill (Victor), Lenore Suman (Harlin), Eva Shill (Ken), Nina, Roland (Charlene/Cheryl), and Duffy (Mary Jo/Louise). Christeen met and married her sweetheart, Jerold John Hall, on February 23, 1944, and lived the remainder of her life in Mesa, Arizona. She was a lifelong member of The Church of Jesus Christ of Latter-day Saints where she served in many capacities throughout her life. She was loved and will be greatly missed by her large family. Christeen was preceded in death by her husband, Jerold J. Hall; son, Darwin Hall; her parents; and all of her siblings. She is survived by her daughter-in-law, Terri Tate Hall and her daughters, Pam Councilman (Dave), Marsha Snow (Paul), and Jerrilyn Wilcken (John). She is also survived by 24 grandchildren, 95 great-grandchildren, 2 great great-grandchildren, and many nieces and nephews. Funeral services will be held on Wednesday, June 13, 2018, at the Mesa North Stake Center, located at 933 E Brown Rd, Mesa, AZ at 10:00am, with a viewing prior to the service at 9:00am. There will also be a viewing on Tuesday, June 12, 2018, from 6:00-8:00pm at Bunker’s Garden Chapel, 33 N Centennial Way, Mesa, AZ. Beautiful, humble and great lady who loved her family and she was not afraid of hard work and service to others-she made a lot of house slippers for others on her breaks while she worked at Skaggs on East Main Street in Mesa. Surely there is a great reunion going on at this time!!!! Christeen was a dear friend of ours for years, especially when we lived in 28th Ward and her husband was our Bishop. She remained our dear friend throughout the years. She was a special lady. She always sent us our very first Christmas card every year, we could count of that. She was always interested in our family and we loved to talk to her. Over the years we moved to another Ward, but she remained a very special friend over the years. I thought of her every time I drove past her house on University. I wish now that I had called her more often. My husband, Donald Glen Millett just passed away in March, I’m sure they will connect in the next world. My deepest condolences to all her family. I loved this great lady and I know she will be missed by all who knew her. She was an important part of my life as is her daughter, Jerilyn. What a great lady and kind soul Auntie Teen was. We are in month 15 of our 23 month mission for the LDS Church and couldn’t make arrangements to be there. To all of our cousins and friends, we love you and hope to see you sometime. My brother Gerald had a massive heart attack at about the same time that Auntie Teen passed. He is doing well but we pass along his love and condolences to you all. God be with you Aunt Teen, Till we meet again.